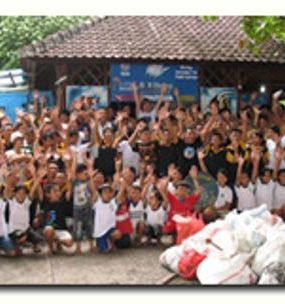 (5/17/2010) Komang Astika of Biorock Center and Renaud Wicky of Bali Diving Academy know how to make "kid's play" of working for a greener, more sustainable world. 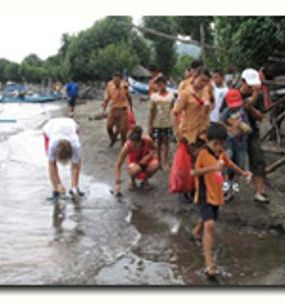 On Earth Day, April 22, 2010, the two men organized 200 children from a community school in Pumetarn, Buleleng, North Bali to clean the shoreline near their home. Outfitted with gloves and recycled empty rice bags, the one-hour beach clean up collected over 200 kg of discarded plastic bags, ropes, fishing line, plastic bottles and empty cigarette packages. After the clean up, Komang Astika led the kids in an educational seminar on how the award-winning the Biorock project is rebuilding damaged coral reefs. Komang, who works with the Biorock project, shared videos showing the beauty of the new coral and the rich aquatic life in the waters surrounding Pemuteran. He also shared how his group manages to grow new coral reefs in cooperation with the local community. The focus of world-wide scientific attention for its success in Biorock development, Pemuteran is home to the largest reef rebuilding project in the world. Over 50 steel frames of varying shapes are hosts to fast-growing new reefs stimulated by low-voltage current running through the frames. Since its inception in 1998, Biorock has forged a successful community-based environmental movement in which volunteers and local residents create new reefs, while local fishermen, who once bombed coral formations, have now become front line defenders of reefs that are the source of sustainable fish populations and bring employment-generating tourists to their area to snorkel and dive. Shown on balidiscovery.com are photos of the kids of Pemuteran cleaning their beach on Earth Day 2010.